I am going to be ordering a triple weber setup for my L28. I've been running the round top SU's with SM needles. They go lean up top despite the needles and repeatedly checking the floats/fuel delivery/etc. Looking to go triples. The good news is my engine was built as a backup for a race car and it came in the crate with jet sizing written on the valve cover. So I have a good starting point. Just hoping you guys can help fill in the blanks. I am learning here. So what else is missing from those settings? Based on those and what I've learned in some helpful searching it seems I need to go for the 45's and use a 38mm choke? Do the rest of those settings make sense? I have a mildly built Datsun spirit L28 and I run DCOE 40's with 32mm chokes. My jetting is based on a 40mm carb, so I cannot comment on how the 45's would take to my setup. However, lets us take a step back. You own a street car I assume and this is a back up for a race engine, which means those settings may be great for a race engine but not for a street engine. The difference is actually quite important. A street engine spends a lot of time at idle and even more time in the midrange were you want a good amount of torque and response. Off idle response and the transistion from idle jets to the mains is a vitally important for a street car. Now for a race, car what matters is peak HP/torque and quite a lot of time is spent Wide Open Throttle (WOT). Idle quality, efficiency, smooth transition are not nearly as important. A weber is a wonderful thing. It can be tuned to hit many critical areas. But it usually has to compromise somewhere. Be mindful of the difference between a street engine and a race engine. A race engine will not be happy living in daily traffic. I would think that those settings will make lots of power, but may not produce a happy street car. Thanks for the reply! Fast forwarding here..I have installed a set of 45's and installed the jets as seen above. I just got the car up and running this last weekend and have driven it a couple times. Idle is great...900rpm...mixture screw is 2 3/4 turns out which seems good for the later 152 45's. I synced the carbs as well. The car right off idle and low throttle driving around is great...great response off the line. As you roll into it or if you stomp on it a lower RPMs...there is a big stumble or even complete lack of power. So I assume this is the "transition" phase and there are like 4 things impact that. High RPMs...holy crap! It's a completely different beast now than it was with the SU's...1st is all wheelspin and so is most of 2nd. So where do I start with tackling the transition flat spot? I have a tailpipe O2 sensor I can plug in and see if it's going lean or rich where the stumble is. The engine seems good with running in traffic and such. I put 2K miles on it last summer with the SU's. The idle is certainly a bit lumpy, but sounds good and holds...doesn't overheat. I kept the stock flywheel on it so I think that helps it out at idle and such. I think you've seen this but I'll put it up anyway, maybe it will be helpful somehow. I hadn't seen that thread yet, thanks! The choke X 4 theory means I need to go back to the 145 mains that came with my carbs and can keep my 185 air corrector most likely. For all I know the settings he had above were for 38 chokes since it was for a race car. Gives me a good spot to start! So my "flat spot" is a lean spot in the transition as I found with my wideband. I double checked the float heights, also tried putting in the 170 air correctors I had on hand to try to richen it up a bit. So...where do I start? I hate to just buy a bunch of jets randomly. Richer Idle jets? Richer Mains? Accelerator pump jet? The accelerator discharge valve I have is the one with no hole in it....not sure if that helps or not. The flat stop isn't there when on the highway and the revs are up...probably because it's already running on the main circuit by that time. At lower speeds if I stomp on it or roll into it, the engine just loses all power until I let back off the throttle. 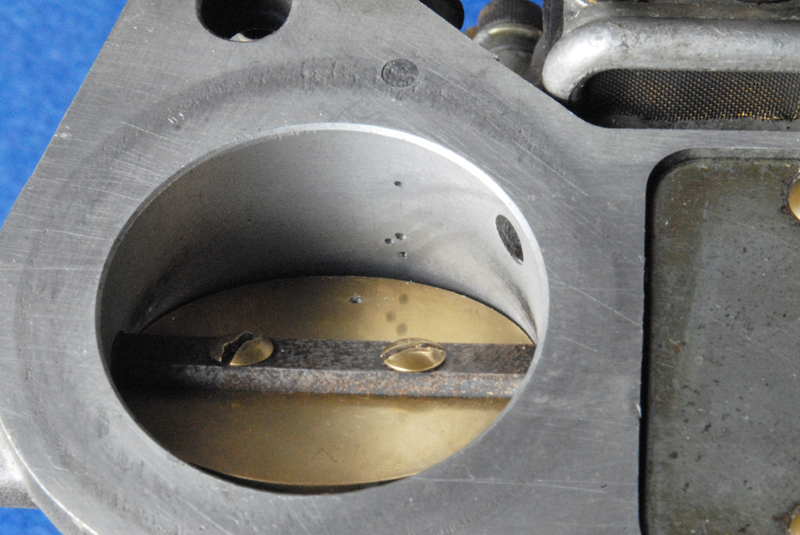 Have the Carbs been rebuilt after you bought them? Did you check for Accelerator pump operation with the carbs off the car. I put some solvent in the bowls and then give them a quick test off the car... in a safe area of course and with a Fire Extinguisher handy. Often the accelerator pump passage gets gummed up with Varnish or crystals. Excellent video on how Weber pump circuits work and shows all the components. Component check is good, as sometimes Race Carbs have some strange Modifications made to them. To fix a flat spot in transition, that is due to a calibration error ( Not plugged passages etc ) you want to lean towards a larger pump jet and a stiffer spring. This gives a sharp hard shot of fuel needed for street use. The spring tension plays a bigger part than most people realise. 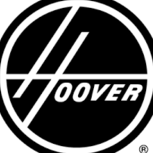 What number are your accelerator pump discharge jets and are they clean? That tiny aluminium washer on the bottom is important. Independant runner carbs also require a Unique distributor advance curve. They need a lot of static advance at idle. 15 to 20 degrees depending on Camshaft is normal. Total mechanical advance is the same as the SU's, so you usually have to Weld-up the advance slots or limit total mechanical advance somehow. Vacuum advance really improves cruise milage, but it's hard to run a Vacuum advance with Triples on the street due to the strong Independant runner pulsations. Some manifolds have a balance tube built in... much like the balance tube on the SU's. The purpose is the same. to act as an accumulator and dampen the Intake pulses ( or " Combine " them ) to get a usable Vacuum signal for the Vacuum advance. These manifolds are rare, because most of the Triple or Twin ( 4 cylinder ) IR runner manifolds were meant for racing. The carbs are brand new. So everything is good to go. The pump jets are 45's. Additive RPM timing: All degrees are in Crank degrees All values are automatically interpolated on a curve. Oh... I figured they came with the Race Engine due to the first picture of carb jetting on the VC. Accelerator pump jets and the pump spring tension may still have to be changed to match particular engine builds. New does not necessarily mean " Good to go ". Carbs come with " Generic" settings. Tweaking after install, to suite your particular engine characteristics is often required. 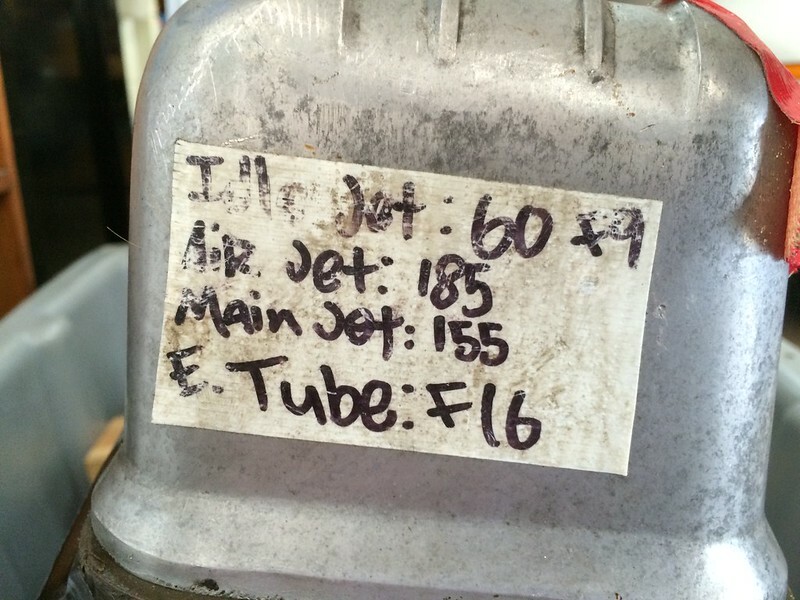 You may need to go to the stiffer pump springs and 55 pump jets. That will give a sharp hard shot to fill the low speed lean spot. And do physically check pump operation. Sometimes machining swarf will block passages. happens more these days with " Global " economy. Another question. New carbs typically come jetted for street use and the chokes installed from the factory. Did you change the factory jets and chokes from what they came with? The picture of the Race engine carb specs and previous replies seem to imply that??? What were all of the original jettings and specs, and what, if anything did you change ? BTW, do adjust timing as suggested. It doe make a big difference to IR carbs. If you have a larger camshaft you can even start off with a Static timing of 17 to 20 degrees. I did see the pump working when I was looking at it last night. At least on the rear carb...I'll check the other two. I did change the jets to what is in the first picture. Currently that is what I am running but switched back to the 170 air correctors that came with the carbs to see if that fixed the lean spot...which it didn't. Chokes are 36's that came with the carbs. Timing is set to about 18-20. Vacuum advance is disconnected. So....55 pump jets? Where do I get the stiffer springs? Or should I do a F11 E Tube? The large 36mm chokes may be the challenging item for street tuning. 1. Fuel level: higher fuel level brings the main in earlier. Stock level is ~ 29mm but you can push it you towards 26mm if you can deal with the other side effects. 2. New E tubes biased towards more fuel in the lower range. 1. Adjusting the throttle plate so that it is as close to completely closed at idle (if your carbs have idle bypass balance passages you can use these). 2. Use a richer idle jet. 3. Raise the fuel level in the bowl. I would not worry about the acceleration jets until you exhaust the above. FYI A typical test method (for conducting on a flat road without a lot of traffic, stops, etc.) is to remove the 6 main jets and run around on idle jets. This exploratory real-world driving will tell you how well the idle circuit works and its rpm range. (critically the rpm's and loads where the idle circuit stops contributing to going forward ). You should be able to get a good idea of how much it is contributing to the transition circuit. You may have to tune it to attain higher rpm range to help with the transition. You should be able to slowly accelerate to highway cruise speeds on the idle jets. Do this and tune the 3 items in B above to get the idle working nicely into the transition RPM's of 2000 to 3500. Drive out to a quiet country road (typically the ones alongside rivers are flat). Pull your main jets on the side of the road when at the test location... enjoy. I do have the air bypass screws on my carbs...so I can try setting up the idle using those...they are all closed now. If those steps don't work...I'll attack the main/choke. Ok, just re-synced carbs by first lowering idle to ~600rpm then using air bypass valves to bring it back up to ~900 all in sync. Test drive.....it's 75% better! Still a bit of a "hole" in the transition, but certainly a big improvement. I did order the 65F9 idle jets. So I'll install those when they come later this week and report back. btw you can open up your idle enrichment screws to speed up idle with the throttle plates closed. It adds both air and fuel at the same time. For selecting the correct idle jet, you will have to prioritize the cruising and transition circuit first as there is no adjustment for tuning this circuit this except by changing the idle jet size and fuel level. 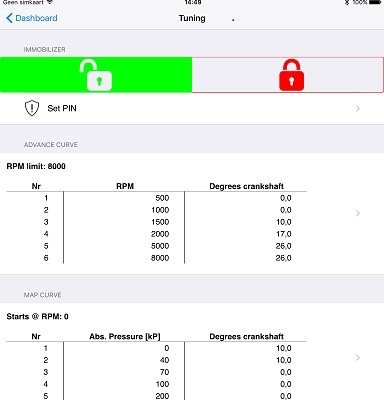 Once you get a good air/fuel mixture at cruise, you can go to the idle circuit and set the idle enrichment screw and air bypass to tweak the idle. Finally you do some WOT runs to tune the main circuit and select the main jet and air corrector. It is iterative and there are some interactions between all of the circuits so it takes a while to get it all under control. One of the most overlooked aspects of tuning is to get all of the slop out of the linkage and to ensure all throttle plates are opening at the same time and the same amount. Make sure all 3 linkage arms are fastened at the same angle to the main throttle rod and that all rod distances are the same. The air bypass is a strange cookie. It is down stream of the butterflies correct? I have left all of mine closed since I have been tuning webers. I always thought that I never needed them. I am not entirely sure of their function. Because both throats are controlled by a single idle set screw, sometimes wear or manufacturing variations cause one throat to flow more than the other at idle. The bypass is used to balance air flow between the two throats. 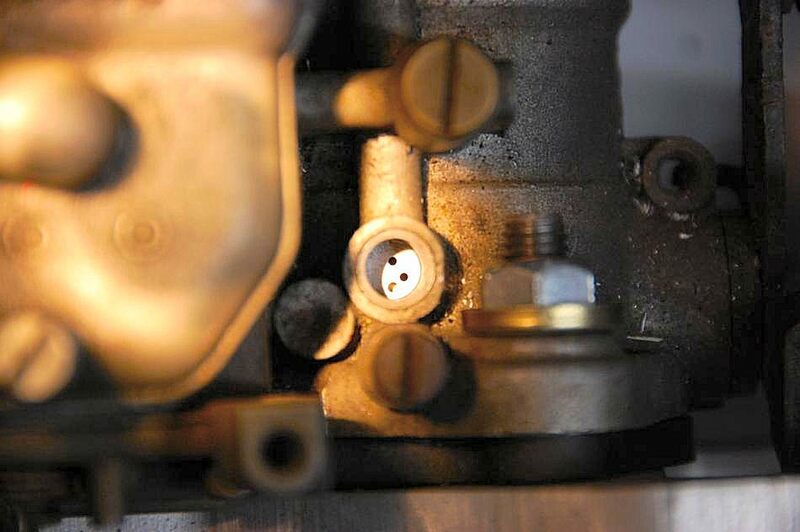 Normally the bypass valves are closed off but if one throat is flowing more air than the other at idle, you can balance the carb by opening the bypass on the throat flowing less air. This procedure is only needed at idle. 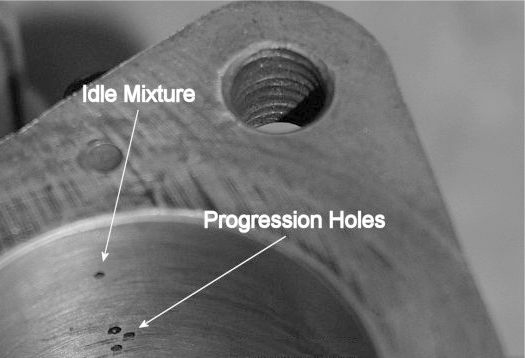 FYI: The old way was to drill small holes in the throttle plate to balance (see photo below). (btw the holes solder-up nicely if over-drilled). I checked the throttle plates vs the progression holes and the plate is closed past them at idle. New idle jets show up tomorrow and I am also getting a bung welded into the collector so I can get a better reading than my current tail pipe clamp on setup. I'll report back. Great! You are in business! I did some reading on the air bypass. Yup, I concur with your explanation. New healthy carbs should not need them open at all. But what an ingenious thing to include on a carb to account for wear. I know for a fact my butterflies are set perfectly and I have a good idle and not even a hint of a transistion issue, but I have not checked for balance since I initially set them up. I may have a go to see how close they are now. The air bypass actually lowers the amount of vacuum signal seen on a flowmeter for those of you who are interested. So you take the highest side of each weber and lower it to the lowest side to ensure balance on both barrels. Then you have to match each carb to one another. Very simple and elegant. Love me some webers stuff. Just when you think you know all you need. More info keeps coming in. Properly tuned Webers. Tis a mechanical thing of beauty. btw we are lucky with our forgiving 6 cylinders as one throat slightly off (16.7%) at idle is not as noticeable as on a 4 cylinder (25%).